Deeply nourishes & rejuvenates skin. Argan oil with 5 other wonder oils. Helps improve the look of ageing skin. With essential vitamins & oils. For mature & sensitive skin.Argan+ Synergy is an all-natural 100% blend of precious Moroccan Argan Oil with 4 other amazing oils: Baobab, Kukui, Moringa and Sacha Inchi, all selected for their restorative, regenerating and nourishing properties. Argan Oil With Vitamin E, Carotene (antioxidants) and Omega 6 and 9. Baobab Oil Vitamins A, D, E and F as well as Omega 3, 6 and 9. Kukui Seed Oil Rich in Linoleic and Linolenic Acid (essential fatty acids). Moringa Oil Rich in antioxidants plus vitamins A and C. Sacha Inchi Oil Contains extremely high levels of Omega 3 and 6 plus Vitamin A. Argan+ Skincare blends precious Moroccan Argan Oil with wonder oils and effective anti-ageing ingredients to deliver beautiful results. With regular use, skin is left feeling hydrated, revealing a fresher and younger looking complexion. 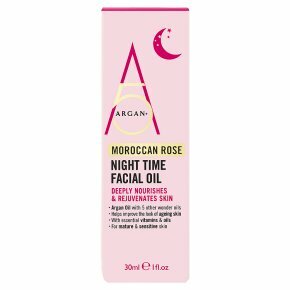 This nourishing Night Time Facial Oil helps transform your skin to leave it softer and more supple. Made from 100% natural oils, including nourishing Argan, Almond and Geranium, it helps prevent moisture loss and the formation of fine lines. Antioxidants and vitamins further help to protect and boost skin vitality. Fragrance free. Derma tested. Directions for Use: Warm a small amount in the palm of your hands and gently massage into cleansed face, neck and décolleté. For external use only. Should irritation occur, rinse well and discontinue use. Avoid direct contact with eyes. If products gets into the eyes rinse well with water immediately. Due to natural oils, product colour may vary. Do not use on areas of broken or damaged skin. Avoid direct contact with fabrics as may cause staining.